The inverters are designed to produce the systems rated output with the components operating at 80% their design specifications. The inverters operate and react according to the demands of the load. When the load requirement changes (non-steady state) the inverter will adjust to produce the required output, but it can only do so if its sources, the Rectifier and Batteries can supply its needs enabling it to produce the required output. Assuming that the system Inverter, Rectifier, and batteries can maintain the output the unit continues to operate on the inverter, if the inverter output drops below specified output the unit will either transfer to bypass or pulse the bypass to meet the load demand (inrush current) depending on the size and # of occurrence over a specified time the unit may return to inverter operations or stay on bypass. 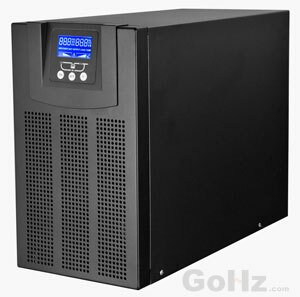 One solution is to oversize your system to ensure that the rectifier can provide the inverter demands. You can also alter the configuration providing an external charger to maintain your batteries, enabling the UPS rectifier to meet the load demands. Another solution that has increased in application, is to incorporate a DC Flywheel in your system, the benefit of the flywheel is it provides a continuous DC output with a better reaction time then the units rectifier, which prevents the inverter from drawing on the batteries to maintain the increased load demand (inrush current) caused by your motor loads.